The BR Beer Scene: Two Christmas Beers From Ridgeway Brewing. On a recent trip to the Chimes this past weekend, after checking out the Fancy Lawnmower Beer from Saint Arnold, I decided to check out a few offerings on their holiday beer menu. First on the list was Delirium Noel, a delicious Belgian ale that I've tried many times before. I'd highly recommend it to anyone looking for something strong and different, although a little pricey. 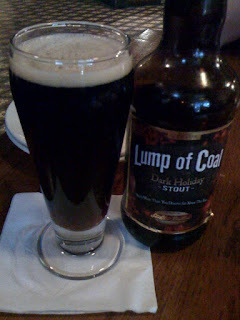 Since I'd had one recently it was time to look for something new, and the first one that caught my eye was "Lump Of Coal," a strong English stout. I wish I had a better picture, but I'm still on the old iPhone 3G with no flash and a crappy camera. Maybe after Christmas I'll have something better. Anyway, back to the beer... as you can see it pours a predictable dark brown with a bubbly off-white head. The aroma reminded me of plums and chocolate... not bad. A little coffee bitterness in there too. The taste was more of the same, but not very well balanced and the beer came across as a little watery. The first hit of each sip was strong with chocolate and fruit flavors, but then nothing else came out. A decent beer, but at $9 for a half-liter bottle, I'd skip it next time. 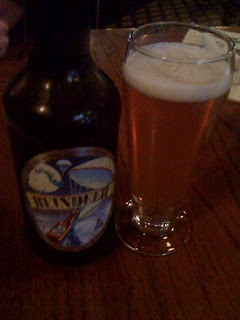 Second was the "Reindeer Droppings" English bitter, from Ridgeway Brewing, the same British brewery that produced the "Lump Of Coal" up above. In fact, it seems most of their beers are holiday-themed offerings... interesting. This one, as you can see, was a much lighter color, with a lighter head. The smell was hoppy and grainy at the same time, and the taste came across much like a milder version of an American IPA. It's cheaper than the "Lump Of Coal" at $6.50 for a half-liter, and I'd recommend it to anyone looking to try something new but not sure how hoppy they like their beers. In the end I rated both beers at a B-, which labels them as "worthy" according to BeerAdvocate and I can agree with that. Due to the prices I'd definitely go back to the "Reindeer Droppings" first but either way it's good to see some new seasonal offerings.